Well this certainly grabbed my attention from the start, with one of the most horrific scenes a mother could ever come across. Beth was in the cellar, where her mum worked, pinned down by a man with his intentions very obvious. OMG, every primal instinct that had been passed down by my ancestors would kick in to protect my daughter, no matter how old she was and actions would definitely come before any words. Now the bloke was dead and soon to be married daughter Beth tells her it wasn’t as it all seemed. Rachel is determined that this won’t ruin her daughter’s future and so a cover up begins. To say that I was stunned by Rachel’s reaction afterwards is a gross under statement and I have to say that I took an instant dislike to her. Ok there were times in the story that I felt a little sorry for her but on the whole I found her shallow and controlling. Poor Beth, who to be honest was pretty shell-shocked, at first numbly went along with what Rachel was doing. After all mums should know whats best, right? The chapters alternate between mother and daughter which I at times read open-mouthed. Rachel certainly has the rose-coloured spectacles on when things start to fall apart, including the sanity of her own daughter. There is far more to all this than meets the eye. 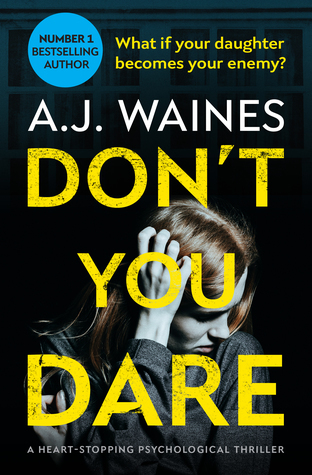 What begins as a story centring round only a few characters to begin with gradually expands, but A. J. Waines makes each one very distinctive and were easy to keep fixed in my mind. This is a truly edgy story where you may not always pick up on things consciously at first but it all sits in your mind niggling away. I loved the build up in the story where each twist could have made it at alternative ending but boy I wasn’t disappointed this author just squeezes every ounce out of giving her readers the whole caboodle. She must be drained because she gave me everything I needed in a super story. Just brilliant! I wish to thank NetGalley and Bloodhound Books for my e-copy of this book with I have reviewed honestly.